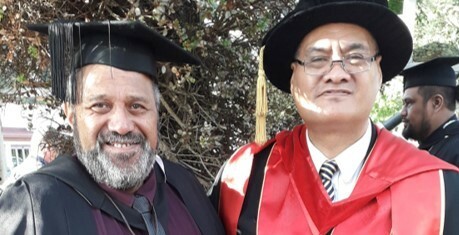 The FDR Centre is honoured and delighted to announce that one of our Senior FDR Mediators, Ngarongo Ormsby (Ngāti Maniapoto, Tainui & Ngāti Ranginui), has recently graduated from Te Whare Wānanga ō Awanuiārangi in Whakatāne with a Master’s Degree in Indigenous Studies, majoring in investigating Māori Depression. Ngarongo described the need to research and draw on ancestral knowledge as a means to describe westernised epistemologies and pedagogies by codifying the dominant narratives and discourses from a Māori worldview. Māori have lived in a bi-cultural world from a subjugated positioning since the signing of the Treaty of Waitangi 1840. The research analysed a component of depression (DSMV) and then investigated a Māori worldview of Māori depression using ancestral knowledge like orokohanganga, pūrākau, pakiwaitara, kawa, tikanga, kaupapa, whakapapa, kōrero. The outcome created a transformative model of practice termed ‘Rangi-Rua’ (of two-minds) utilising the best methodologies of both worlds to support navigating clients from a place of deteriorating mental health and imminent death in Te Ao Pō (world of dark) by suicide to walking them out into the sunshine of Te Ao Mārama (enlightenment and hope). Following on from his recent achievement, Ngarongo is taking his studies and research to an even higher level by enrolling for doctoral study. The area of research interest for his PhD will focus on Māori Conflict and in particular, he proposes to investigate the cognitive construct legacies of colonisation value narratives impacting on whānau relationship systems.